Well it looks like it is official. Santubong has been gazetted as a national park according to a report in the local press. Tucked away in an article headlined “Illegal logging still under control: Tengah” in today’s Borneo Post is a small paragraph quoting Second Planning & Resource Minister Dato Seri Awang Tengah Ali Hassan as saying that Santubong National Park covering an area of 2,000 hectares was “gazetted recently by the government”. I recently heard through the Sarawak ‘coffee shop rumour mill’ that Santubong had finally been gazetted as a park but I hadn’t seen any official announcement. With the Minister’s statement in the local press it looks like its official. The Mount Santubong area was first proposed as a national park in 1984 so the wheels of government took a bit of time to spin in to action with this one. But the fact that such a special natural area is now protected is great news for Sarawak. 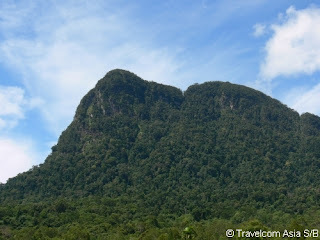 I spend a lot of time in the Santubong area as do many nature lovers who live in Kuching. The area has heaps to offer – some stunning rainforest scenery, clear jungle streams, rich wildlife and some beautiful bays and beaches. Oh yeah, the Irrawaddy dolphins hang out nearby which is an added bonus. There are now three protected areas in the wider Santubong area – the Kuching Wetlands National Park, the Talang Satang marine park and the new Santubong National Park. With such a rich mosaic of habitats in the wider Santubong area, there is certainly room for a couple more protected areas. It would be great if the mangroves at Buntal were protected. And the creation of a “Damai Dolphin Sanctuary” covering the near shore waters off Santubong and Salak would certainly get my vote. I haven’t been dolphin watching for a while, hence the lack of posts. But I have managed a few trips to Sarawak’s national parks including Lambir, Kuching Wetlands, Similajau and Bako. This picture was taken at Bako on Monday. Bako and Kuching Wetlands are the best places for seeing proboscis monkeys in Sarawak. 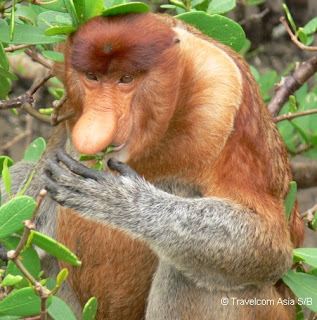 If you go an afternoon dolphin watching trip at Santubong and tag on a mangrove or wildlife cruise there is a pretty good chance of seeing proboscis monkeys in the nearby Kuching Wetlands National Park. And what wonderful creatures they are.